Dredged Material/Marsh Creation – Restore or Retreat, Inc.
Dredged material/marsh creation projects involve the beneficial use of sediment that is frequently dredged for maintenance of navigation channels and access canals, or material may be dredged specifically for marsh creation. The material is placed in a deteriorated wetland at specific elevations so that desired marsh plants will colonize and grow to form new marsh. The project site is in the Barataria Basin Landbridge section of Jefferson Parish, Louisiana, approximately 15 miles south of New Orleans and west of the Mississippi River. It is bounded by the Gulf Intracoastal Waterway on the north, and by non-federal hurricane protection levees to the east and west. The project reestablishes a stretch of emergent wetlands by using Mississippi River sediment and provides an adequate corridor that supports equipment mobilization for long-distance sediment conveyance while minimizing incremental and future environmental impacts. Long Distance Sediment Pipeline – Barataria: The State has combined this project with the Bayou Dupont Marsh and Ridge Restoration (BA-48) project. This project is currently under construction, and a new marsh creation site related to the project was recently approved through the CWPPRA process. million because of the cost of extra booster pumps after the Barataria Water Way, etc. Lafourche Parish Council has committed $1 million in CIAP funding for the project. CPRA and Jefferson Parish officials celebrate the project in Spring 2015. ROR and CPRA visit the site in Spring 2015. 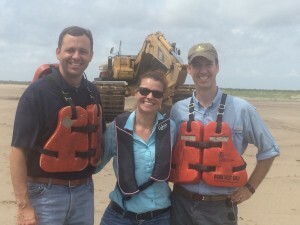 This project seeks to utilize sediments dredged from the Atchafalaya River to restore and nourish the disappearing wetlands of Terrebonne Parish. While the parish has done extensive, successful restoration work in Terrebonne marshes in the past, this project would introduce NEW sediment into our marshes. Once the pipeline is in place, numerous opportunities will be available for utilization, including Coastal Wetlands Planning, Protection & Restoration Act (CWPPRA) projects, Beneficial Use of Dredged Material associated with dredging performed by the US Army Corps of Engineers, Natural Resource Damage Assessment projects, Clean Water Act projects, Gulf of Mexico Energy Security Act projects, and many others. 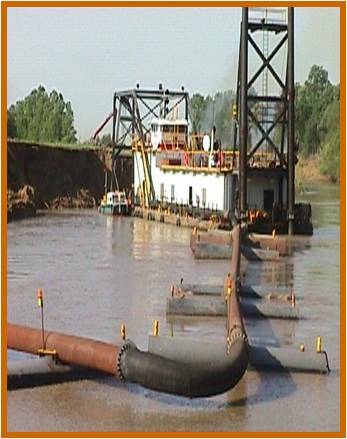 Long Distance Sediment Pipeline – Atchafalaya: According to Terrebonne Parish, this project seeks to utilize sediments dredged from the Atchafalaya River to restore and nourish the disappearing wetlands of Terrebonne Parish. While the parish has done extensive, successful restoration work in Terrebonne marshes in the past, this project would introduce NEW sediment into marshes. Once the pipeline is in place, numerous opportunities will be available for utilization, including Coastal Wetlands Planning, Protection & Restoration Act (CWPPRA) projects, Beneficial Use of Dredged Material associated with dredging performed by the US Army Corps of Engineers, Natural Resource Damage Assessment projects, Clean Water Act projects, Gulf of Mexico Energy Security Act projects, and many others. in 2013, Terrebonne Parish approved the hire of a pair of companies to identify sources of sediment in the Atchafalaya River that could be harvested to rebuild Terrebonne marshes. Engineering firms Moffatt and Nichol and Shaw Coastal identified and prioritized sediment resources in the Atchafalaya. 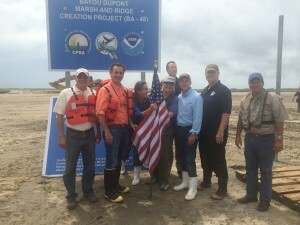 The state matched up to $750,000 in offshore oil revenue for coastal restoration projects to get the project moving. With the initial reconnaissance study was completed, and the State and Parish have moved forward with a second level study to further investigate the implementation of the project.